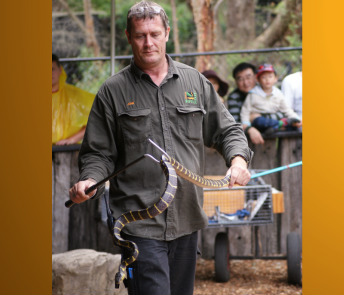 John has over 12 years experience in the zoological industry specialising in venomous snakes. 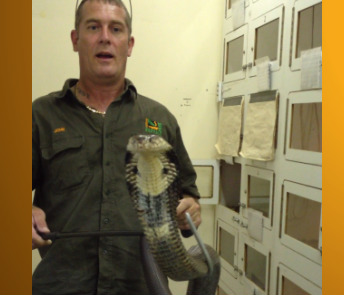 John was the head of the venom department at the Australian Reptile Park (Gosford) from 2011-2015. 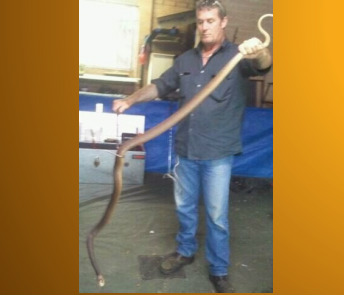 He provided the care of venomous snakes including: Tigersnakes, Cobras and Taipans, Eastern Browns and Death Adders, King Brown and Rattlesnakes, Eyelash Vipers and others as well as being in charge of the venom extraction and milking venomous snakes for BioCSL for the production of Antivenoms. 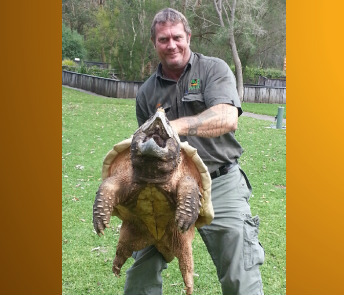 John also worked at Sydney Wildlife World from 2006 -2011 and was Supervisor of the Reptile Department in that time. John also has been keeping venomous snakes privately for over 20yrs, and has been rescuing venomous snakes for over 18 years. Snake Safety Awareness Seminars, for businesses/organisations, where workers come into direct contact with snakes whilst performing their day to day duties. John is a qualified Certificate IV work place trainer and assessor, Certificate III in Captive Animals, Certificate IV Vet Nursing. Tina holds a Certificate III in Captive Animals, an R5 Reptile Keeper's Licence, a Catch & Release Licence and is President of Central Coast Herpetological Society. 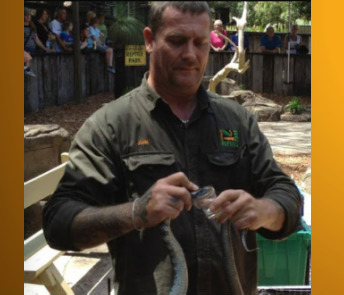 John & Tina run the most UP TO DATE and ADVANCED VENOMOUS SNAKE courses, with an emphasis on safety and because of their professional experience in the zoological industry and due to their popularity, bookings are essential. To date we have trained staff at Major Zoos and Wildlife Parks, NSW Fire, Police and Ambulance Services, SES and VRA, Correctional Services, NPWS Rangers, Council Workers, Energy Workers, Pest Control Companies and Wildlife Rescue Groups such as NATF, Wildlife Aid, Sydney Metropolitan Wildlife Services and South Coast Wildlife Rescue, as well as private individuals. We are licensed by Department of Primary Industries, and are fully insured. We are licensed by OEH for the relocation of all problem reptiles and are fully insured. We are also certified trainers for Environment & Heritage Protection QLD for all Venomous Husbandry & Handling Courses and Catch & Release Training Courses. 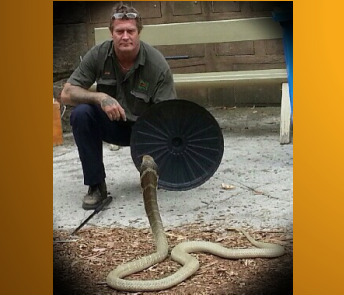 If you are interested in a Training Course OR hiring John's Reptile Awareness Displays for Venomous Snake Shows (with an emphasis on First Aid for Snake Bite), Snake Safety Awareness Seminars, Site Risk Assessments, or Reptile Relocation you can contact us by mobile phone on 0416 922 282 or 0425 237 682. We are also available for any Media enquiries.